Developer: Fluid Studios, Paragon Five, Inc. 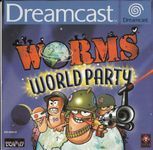 Developer: The Code Monkeys, Ltd., Team17 Software Ltd.
Worms World Party is a 2D turn-based strategy game. Each player controls a team of worms trying to destroy the other team. It features a wide variety of weapons and gadgets.